Of all the countries I have visited so far, Austria is still one of my favorites although it is not the absolute favorite. That honor goes to Malta, but Austria holds and will always hold a special place in my heart. After all, it was the 30th country that I visited for my 30th birthday. Even though I saw many marvelous sites, my only regret during my visit was that I did not have time to explore the country further. A majority of my time was spent in Vienna. This was actually somewhat accidental. I had vastly underestimated how much there was to see there. It seemed that every new street led to a new treasure to check out, and as a result, I got so preoccupied with exploring Vienna that I never got to visit other places, such as Salzburg, Graz, or Innsbruck. My initial plan was to spend a few days in Vienna and then spin off day trips to some of the aforementioned cities and smaller towns. Unfortunately, that did not happen, but that is what sometimes happens when traveling. However, next time I return, I definitely plan to take a few more day trips. I had scheduled a week-long visit to Austria to see everything I could before heading off to another destination. However, before I knew it, my trip was coming to an end, and I had not left Vienna at all. 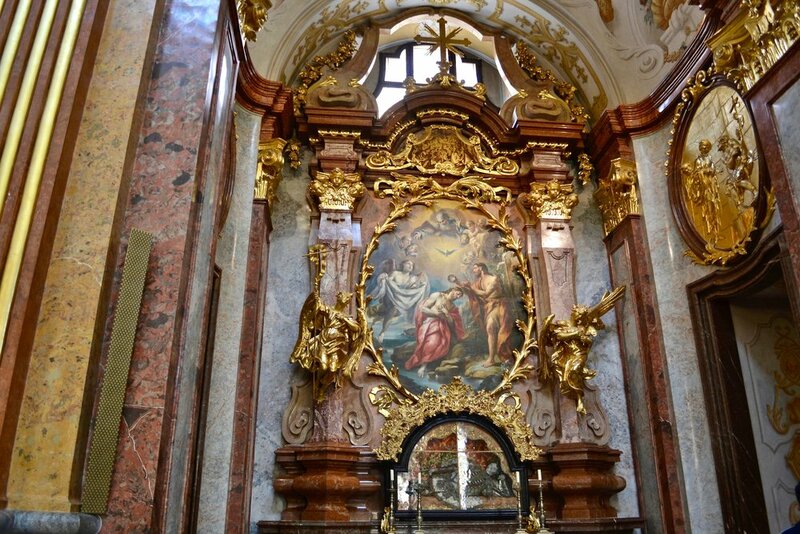 Therefore, I decided to take at least one day trip, and that day trip was to Melk Abbey, which is about an hour away. Like other places before, I had some basic familiarity with Melk Abbey and its history and place in art from my time in graduate school. However, at that time, the thought that I would ever get to see the place in person was wishful thinking. Yet, as I previously stated in my article on beautiful places to visit in southern Germany, life has strange ways of working out, and in September 2013, I found myself on a train heading from Vienna to the town of Melk. Getting to Melk was quite simple and not complicated at all. There are several ways to do it, but in my case, I went by train. First, I caught a train from Vienna Hauptbanhof and headed to the town of Sankt Pölten, which is about a half hour away. After a short transfer, I boarded another train at Sankt Pölten and took it until it reached the town of Melk about twenty minutes later. Finding the abbey from the Melk train station was quite easy. The abbey is located on a rocky outcropping that overlooks the Danube River and towers over the town. All I had to do was walk in that direction, and I soon found myself in front of it. While the abbey church is the most famous part of the entire abbey, there are artistic treasures throughout the monastic complex. Upon entering the on-site museum, a visitor can see various liturgical instruments, such as chalices, monstrances, crucifixes, and different kinds of vestments that the priests used in the Mass. All of these items are quite ornate, heavily decorated, and made of precious metals and stones, such as gold, silver, and crystals. 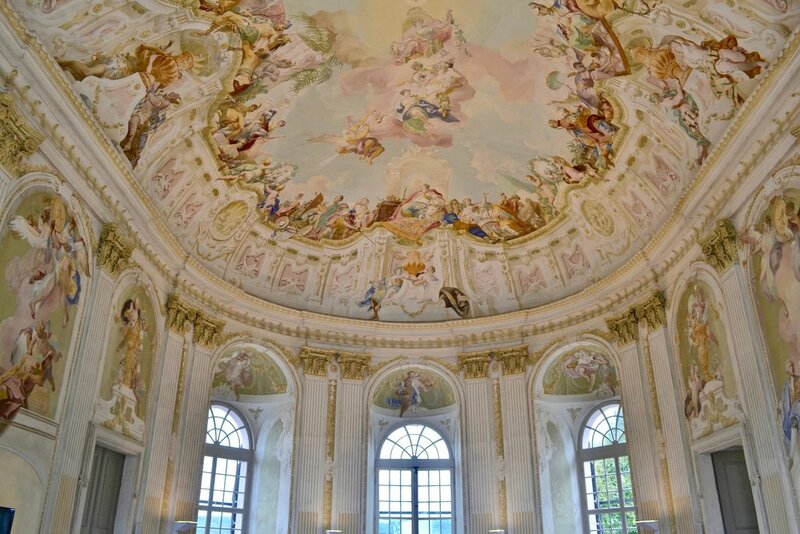 For me though, I was particularly impressed with the numerous large-scale ceiling frescoes that adorned the Marble Hall, church, and garden pavilion. In many cases, if you stand in exactly the correct place and look straight up, you can get an amazing view of various painted works that show mainly religious, mythological, or secular scenes. I had seen these types of ceiling paintings throughout my travels before most notably in Rome with Baccicio's "Triumph of the Name of Jesus" in the Church of the Gesu, "The Apotheosis of St. Ignatius" by Andrea Pozzo in San Ignazio, and "The Allegory of Divine Providence and Barberini Power" by Pietro da Cortona in the Palazzo Barberini although those are certainly not the only places. The key to photographing these types of works properly is to stand in the correct place. If you stand in the wrong place, the perspective won't be 100% correct, and the figures will look distorted. I always try to take the best shots I can when I encounter noteworthy ceiling frescoes but admittedly, I have not quite mastered the art of standing in the perfect spot. Of course, while the ceiling frescoes and museum are fascinating, the absolute masterpiece of the entire abbey is the abbey church. Like many places, the exterior facade, while quite beautifully designed and aesthetically pleasing to the eye, cannot be compared to what awaits a visitor inside. The interior is extremely heavily decorated in an eighteenth-century style. 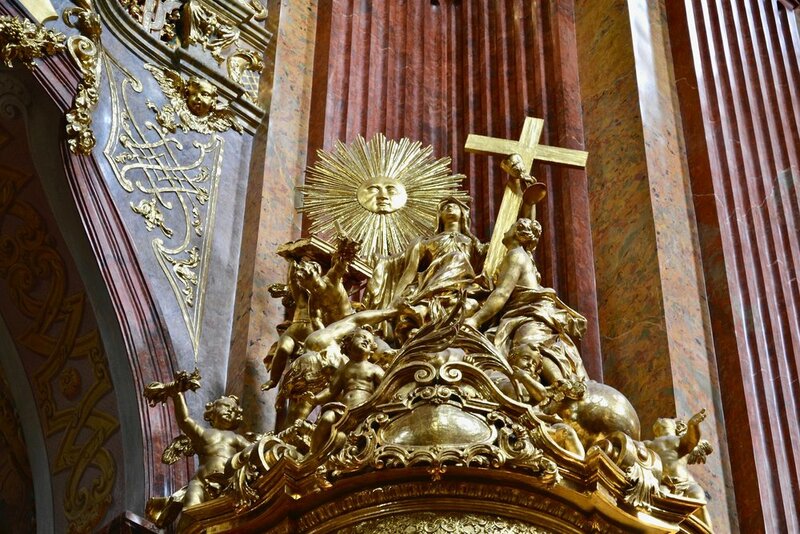 Like many churches that were built during this period, the interior of the church is a veritable feast for the eyes regardless if one is a fervent and devout believer or a militant and skeptical non-believer. It is hard to not be impressed when one sees it in real life. 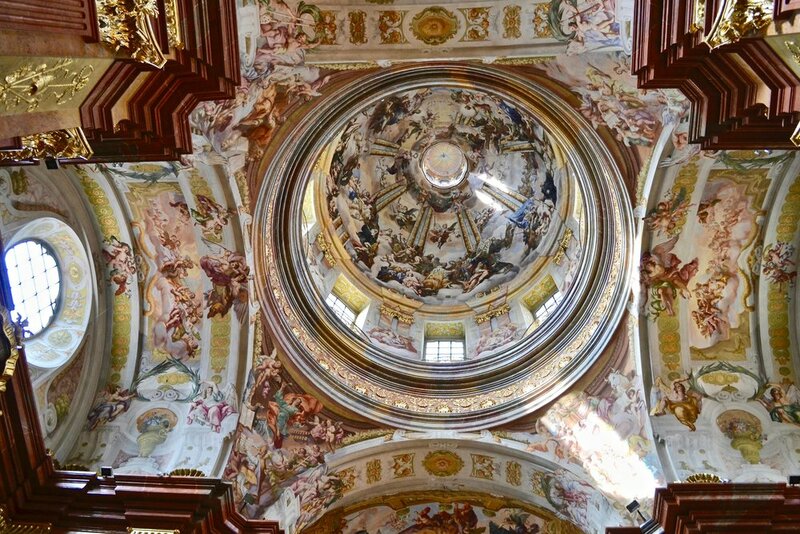 Whenever I visit a place like Melk Abbey, I somewhat return to graduate student mode. That means I try to recall what I had learned about in graduate school in relation to what I am looking at. 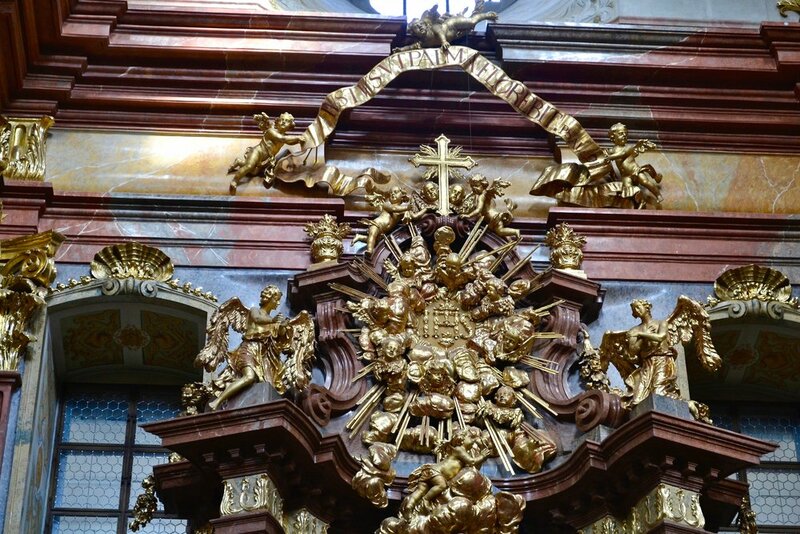 Therefore, I always set a goal for myself to try to examine everything, such as paintings, sculptures, confessionals, pulpit, the high altar, and side chapels carefully and make note of the craftsmanship and style of the artists. However, as is almost always the case, examining something in a picture is very different from examining it in person. For me anyways, I get overwhelmed very quickly by the sheer amount of decoration and artwork packed into one place. As a result, I usually end up wandering around in something of a daze while in awe of everything and trying to capture the best shots for photos. More often than not, I usually completely forget about to trying to examine everything since I rarely know where to start. While the aesthetics and decorations of the church itself are quite beautiful, and the ceiling fresco is breathtaking, this church does hold some macabre yet unique pieces of Counter-Reformation Catholicism. As was previously discussed in my article on sites in southern Germany, Melk Abbey holds the remains of two "catacomb saints." 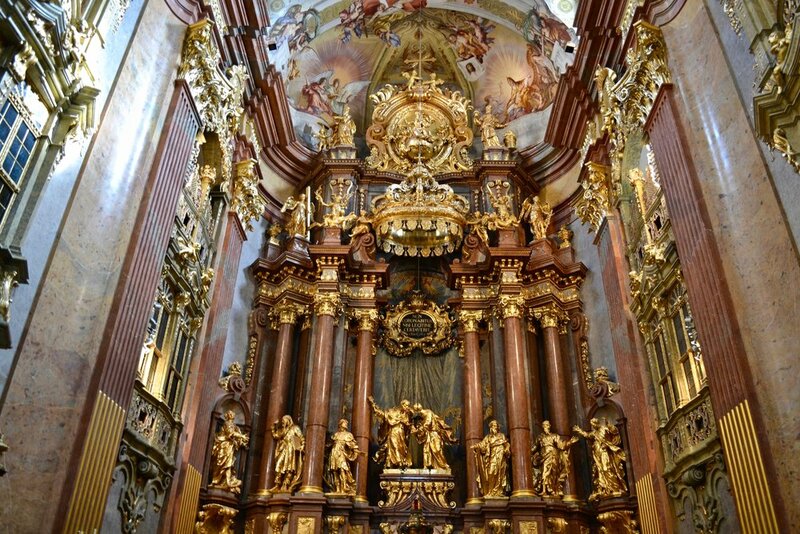 Like Fürstenfeld Abbey in Fürstenfeldbruck and the Peterskirche in Munich, Melk Abbey holds the enshrined and bejeweled skeletal remains of a "St. Clemens" and a "St. Friedrich" in two side altars. Similar to other "catacomb saints" that are found in churches throughout Austria and the surrounding region, these figures were believed to be the earthly remains of early Christian martyrs who were buried in the Catacombs of Rome during the beginnings of Christianity. 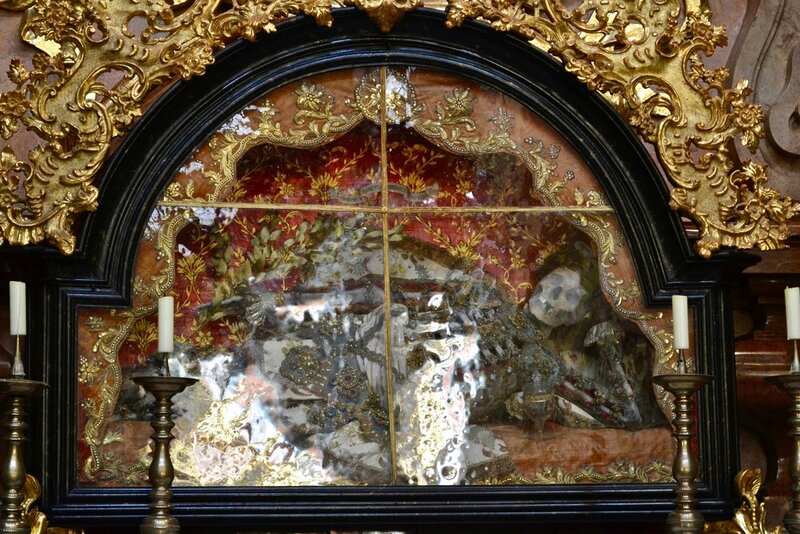 Because of their supposed holiness, the bodies were exhumed and sent all over Europe in order to help foster belief and devotion among the populace during the 17th century. Of course, the question of veracity comes up and who these people actually were. The names of "Clemens" and "Friedrich" were simply names given to them by the faithful centuries after they died. It is impossible to know the true identities of these people, or whether they were truly pious. Regardless of whether one believes they were actual martyrs who died for their faith, what their real names might have actually been, or who they really were, the site of skeletons dressed in expensive fabric and jewels make for interesting and unique albeit macabre sites for the curious traveler. 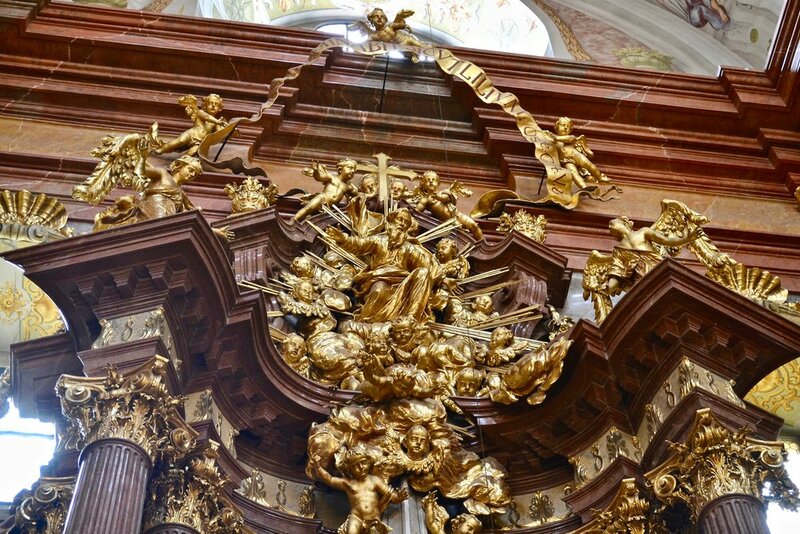 Please enjoy the photo gallery that features images from the interior of the Melk Abbey church. All photos were taken by me using a DSLR and iPhone. Even though the abbey church is the masterpiece and key focal point of Melk Abbey, another wonderful place to visit after seeing the church is the garden pavilion and gardens. The gardens and pavilion are not immensely large in themselves. They initially served as a recreation area for the monks of the abbey in the 18th century, and now visitors are permitted to casually stroll among the grounds and take in the scenery around the abbey. Aside from the abbey church, the garden pavilion was actually one of my favorite spots throughout the entire monastic complex. After spending time exploring the grounds of Melk Abbey, the garden pavilion is a welcome respite for the weary visitor. The pavilion holds a self-serve cafe where one can get soft drinks and different types of sandwiches for a reasonable price. It is actually where I picked up a quick lunch of coke and a sandwich. However, the cafe is not the main focal point. Instead, it is the art that is inside. The pavilion is heavily decorated with pastel-colored frescoes from the eighteenth-century. These frescoes show fantastical scenes which feature a veritable plethora of exotic animals that are not native to Austria, such as lions, camels, ostriches, and elephants. 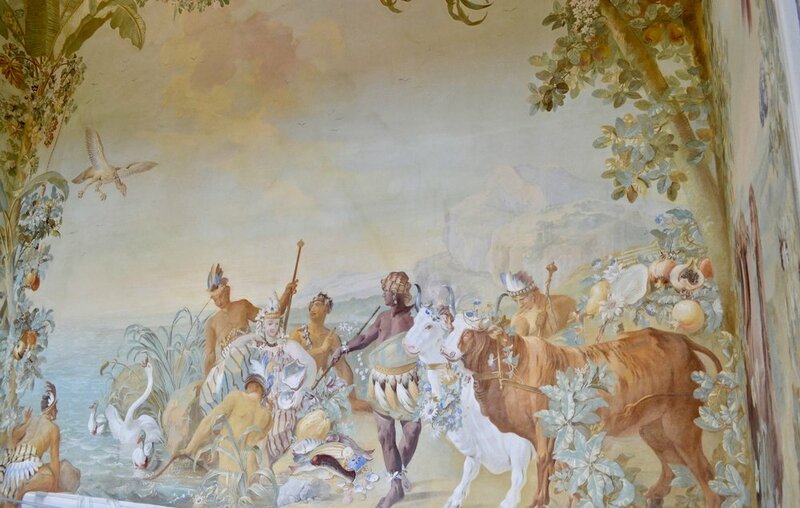 In addition, the frescoes create an element of fantasy since they feature unique plants, fruits, animals, mythological figures, and groups of natives from the New World in an idyllic and Arcadian setting to give the impression of the idea of the "noble savage." 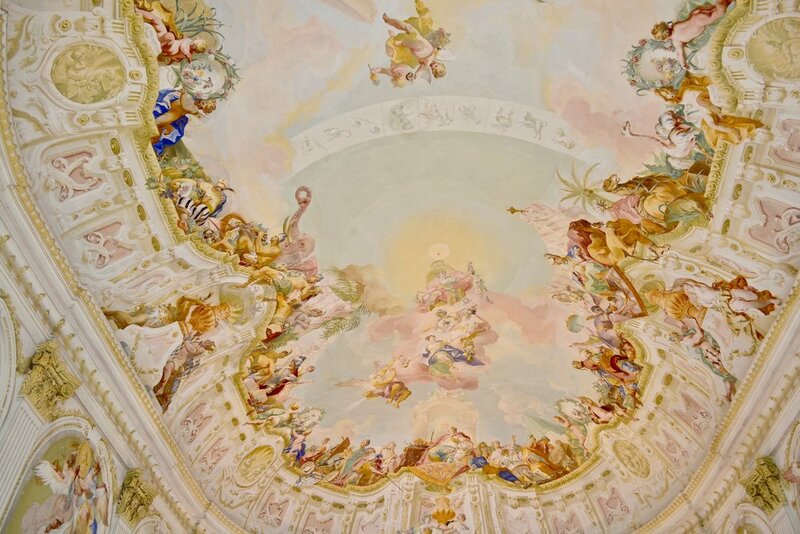 Please enjoy the photo gallery featuring the frescoes in the Melk Abbey Garden Pavilion. All photos were taken by me using a DSLR and iPhone. 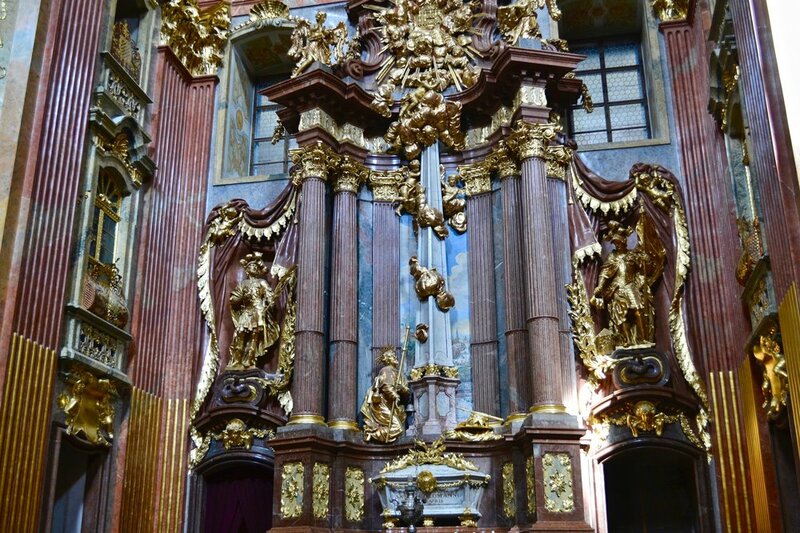 Once I had completed my exploration of Melk Abbey, I headed back to Vienna. The train ride back was quite simple since it was just the reverse of what I had done previously. Even though I immensely enjoyed my visit to Melk Abbey and Austria in general, my one regret was that I did not have enough time to see more of the country. However, I am confident and strongly believe that I will return one day in the future and see everything that I had missed that first time. 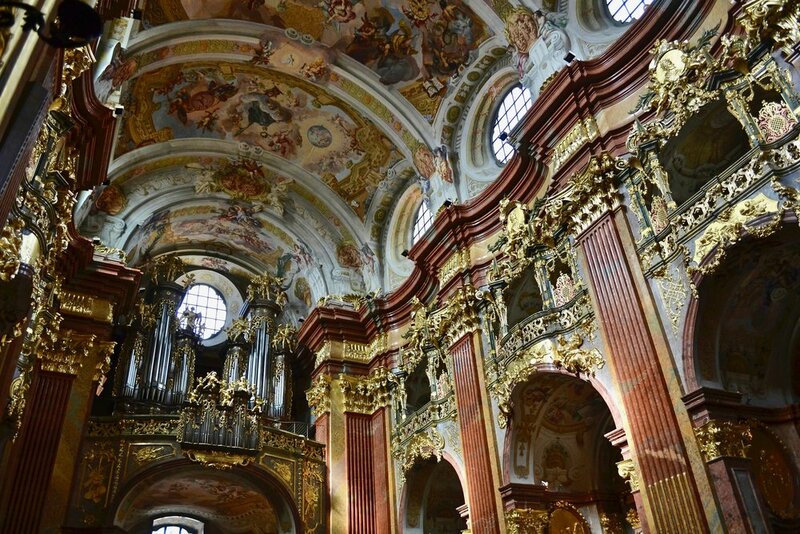 Have you been to Melk Abbey? What did you think of it?